A cold, damp blanket of fog snuffed out our heavenly 70+ degree afternoon today in New York City, to the thrill of some and disgust of others, mainly depending on who was wearing shorts-and-tees. The temperature at Kennedy Airport was 71 degrees at 4:00pm, and abruptly dropped to 59 in the next hour. Even worse, the wind increased from 6 mph to 16 mph, chilling things substantially more, though it calmed later. 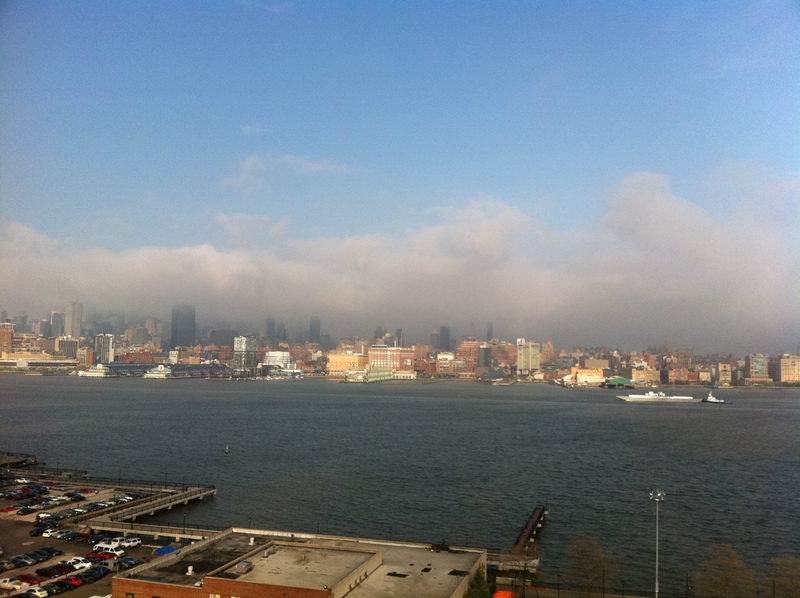 The fog was a marine layer, roughly 300 m tall (aka skyline sea breeze), which plowed in over Brooklyn. Winds at inland sites were variable and light, and abruptly turned onshore as the foggy layer approached — more or less like a cold front delivered from the ocean. Ocean waters offshore are still only 52 degrees F, and keep the ocean breezes cool at this time of year. 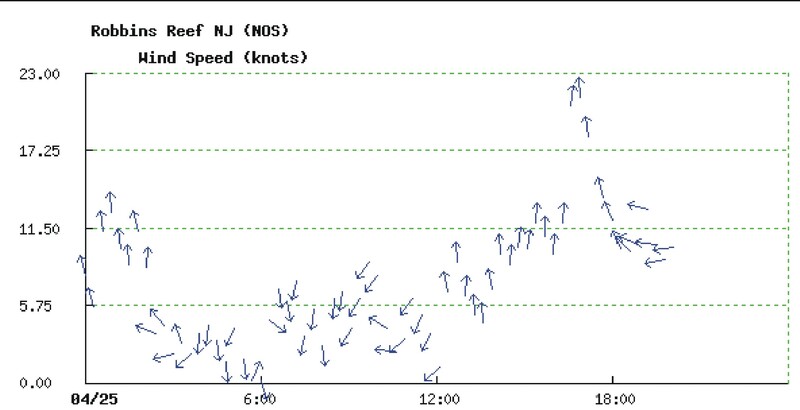 Wind directions as the day progressed (arrow direction - up indicates wind is from the south) and wind speeds (x-axis) at Robbins Reef lighthouse in New York Harbor. So why was this marine layer foggy, when most the time it is invisible? It likely has to do with the extremes we are seeing — the ocean just offshore is still very cold, yet we have a particularly warm, humid air mass moving in from the south these past few days. As this warm air rides over the cool marine waters off our shores, it cools rapidly, and because cool air can hold less moisture, condensation occurs — and that’s your fog. 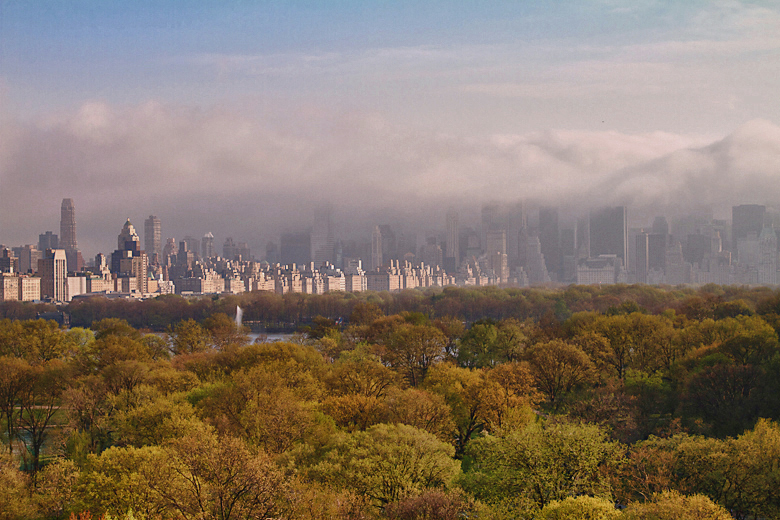 This entry was posted in photography, weather and tagged fog, image, Manhattan, New York City, photo, sea breeze. Bookmark the permalink.